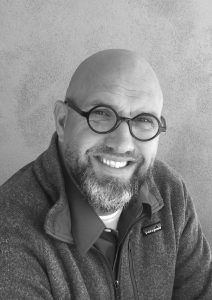 Makemson moved to UNM in 2017 from Belmont University (Nashville, TN) where he was the art education program coordinator and an associate professor of art. Prior to his tenure in higher education, Makemson taught 15 years in community art programs and the public schools of Missouri and Indiana. Community partnerships remain a central focus of Makemson’s work; he serves on numerous community leadership, education, and advisory councils. Makemson was recognized as TAEA Middle Region Art Educator of the Year in 2016 and TAEA Student Chapter Sponsor of the Year in 2015, while students from his art education program have been recognized as TAEA Pre-Service Teacher of the Year in 2015, 2016, and 2017. In terms of creative experience, Makemson trained in printmaking and oil painting as an undergraduate but through teaching discovered a passion for numerous other creative outlets, specifically ceramics, sculpture, stained glass, and graphic design– Branding, toy design, and game design dominate Justin’s recent creative initiatives. Examples of this creative work can found here and here.